As shared parental leave takes effect from 5 April this year, a new Department for Business, Innovations and Skills (BIS) poll reveals some poignant insights into how fathers feel about their children’s early years. The key finding is that two-thirds of dads regret missing key milestones in their child’s life due to work commitments. A quarter of dads have missed baby’s first steps — it’s just 1 in 10 mums — while a third of fathers regret not taking enough/any leave after the birth of their child. One in five dads admit to not being ‘hands on’ enough, leaving their partner to do most of the childcare. 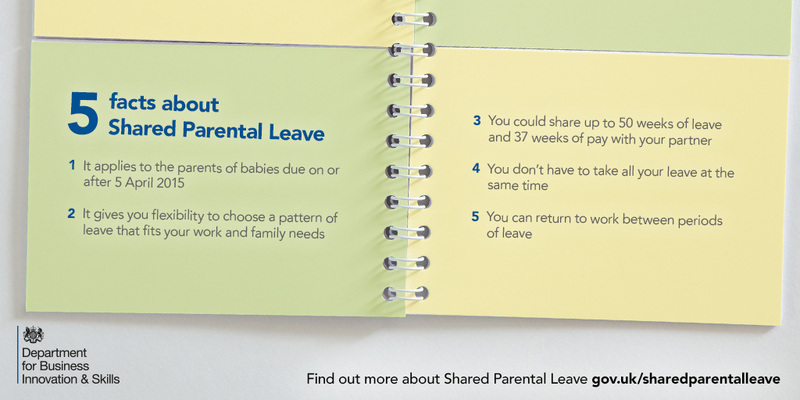 One in three would have taken up the right to shared parental leave had it been available to them. Two out of three fathers said that taking time off in those crucial first weeks and months would have given them more of an opportunity to bond with their baby. Also, half said they would have been able to help out their partner much more. With shared parental leave, parents of babies born or children adopted after 5th April 2015 can split between them what leave they take. Up to 50 weeks of leave and 37 weeks of pay in the first year can be split, and it doesn’t have to be taken in one block but instead can be split over three separate blocks, each of a week or more. This may also have benefits to employers.